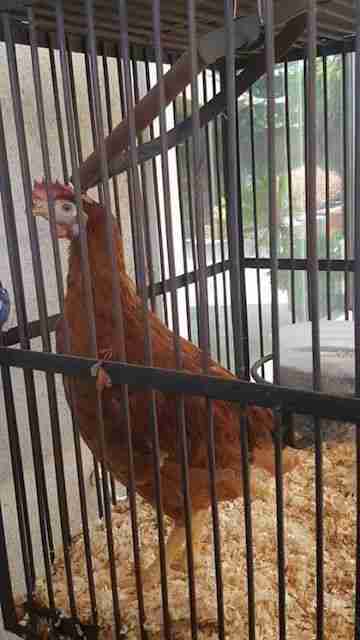 One lucky hen named Peggy, rescued from a religious animal sacrifice in the Fairfax district of Los Angeles last week, is resting in an undisclosed location today-having joined a kind of animal rights witness protection program with other rescued Kapparot hens. "She was running for her life, terrified," said Lola Kay, an animal rights activist who was arrested at a protest of the Jewish ceremony of Kapparot in which thousands of hens were killed. "In the middle of the protest, my friend grabbed her, hid her under her sweater and ran down the block. Another activist happened to have an empty pet carrier in her car. We whisked her away to safety." Peggy, rescued from ritual slaughter in Los Angeles Photo by Sarah Jane Hardt Kapparot is a horror, slaughter and blood bath," said one of the two animal rights activists who were arrested last week in a chaotic scene that pitted ultra Orthodox Jews who were torturing and killing live animals against animal rights protesters attempting to disrupt the ceremony. "She [Peggy] is now a mascot for the entire debacle." After their arrest, the two animal rights activists spent last Tuesday night in jail for attempting to stop the "massacre of hens" at the Yeshiva Ohr Elchonon Chabad in the Fairfax district of Los Angeles. "These people were having the time of their lives, laughing while there's blood everywhere," said Lola Kay. "I was horrified by what they were they were doing to hens and how disconnected they were. I am traumatized. I can still smell the blood and can hear their screams." The religious sacrifice of hens for Kapparot is an ancient Jewish tradition of atonement. The people attending the ceremony, many of them families with young children, were seen violently grabbing hens by the wings, hurling them around and slitting their throats while saying a prayer. Animal sacrifice is a controversial subject within the Jewish community-most Jewish people preferring to conduct the Kapparot ceremony using coins instead of inflicting pain and suffering on a live animal. The alleged purpose of the ritual is to atone for one's sins by transferring them to coins or in this case, a rooster for men and a hen for women. Though it is legal under freedom of religion statutes, the practice is contentious and in LA, Kapparot animal sacrifice organizers hold their events privately, in parking lots, behind scaffolds and out of public view (this is not the case in NY, where the community performs these acts of animal cruelty in plain sight). Having staked out many locations throughout Los Angeles for several nights, activists finally spotted a truck carrying over 2000 hens crammed and suffocating in battery cages, pulling in after midnight to Yeshiva Ohr Elchenon Chabad. This morning, a woman answering calls there for its director Rabbi Spalter, refused to give her name but said, emphatically, "we had nothing to do with it." The American-Israeli Cooperative Enterprise states on its web site that some Jewish leaders feel that people misinterpret the significance of the ritual. The belief that the ceremony of Kapparot can transfer a person's sins to a bird, and that one's sins could then be eradicated is contrary to Jewish teachings. If the ritual could remove a person's sins, what would be the need for Yom Kippur, the Day of Atonement? The organizers of the Kapparot ceremony claimed that the chickens are given to the poor after slaughter but video footage of the ceremony clearly shows the dead chickens being discarded into garbage bags and then being loaded into a sanitation truck. "They tell practitioners that the dead birds are given to the poor, but that is rubbish," said David Rutan, an attorney who served as a legal observer at the protest. "Besides documenting discarded bags of chickens in dumpsters, that would be a violation of the health code to use chickens for food that were not killed in a licensed slaughterhouse." Mr. Rutan added that there is no prior stunning in Kosher slaughter and that the throat is slit so that the bird still lives allowing the heart to pump out the blood. He said, in an exclusive interview, that this practice is currently untouchable legally. "I think a case could be made for the pulling back of the wings and for any deviation from kosher slaughter which causes more suffering," he said. "They started around 5 a.m., said Mr. Rutan. "The police were there, with around 20 activists, many of them Jewish, and they were chanting, "shame, shame! Murderers!" In an exclusive interview, the organizer of the Kapparot event, Zalmen Schnukler, told this reporter, "the only ones who taught the world about having compassion for humans and for animals is the Jews, because in the Torah, you're supposed to feed the animals before you feed yourself!" When asked about the suffering of the chickens during this specific ceremony, he replied, "You don't know what the chickens feel, only God knows!" He added that "If you read the Torah and Talmud, there is a correct way to do things and an incorrect way. Of all the resources God has given, the only one who can use it in a beneficial way, is a human being," adding that "the jungle is useless without man." Kapparot is not mentioned in the Torah or the Talmud. Ritual slaughter is legal under the first amendment. In the 80s, Los Angeles and Hialeah, Florida, passed ordinances against ritual slaughter, however, in 1993, the US Supreme Court ruled that these ordinances infringed on rights of freedom of religion. It is possible to use general animal cruelty laws to stop this practice, said Mr. Rutan. The city of LA is complicit in the animal sacrifice ritual because the organizers routinely request extra dumpsters to pick up all the hen carcasses. Copious amounts of blood flows into the streets and into the catch basins and the sanitation and health code violations go unenforced. Meanwhile, Donny Moss of TheirTurn.net was out filming a massive animal sacrifice taking place in NYC. 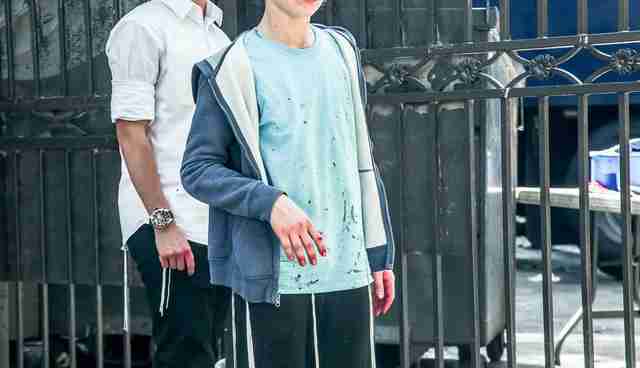 "I am Jewish and seeing other Jews torturing animals right in front of my eyes is surreal. How is it that activists who are protesting the atrocities are able to see the anguish and the pain of the animals but the participants are totally blind to it? Where is their empathy? Nicolas Tomas, an animal rights activist who helped rescue Peggy the hen, says she is doing very well today. "She's getting along and she's eating," he said. "I've taken in a lot of Kapparot chickens and right after rescue, they usually don't eat or drink because they're not used to being fed. They have been through such traumatic conditions, they are scared for their lives when they see any human being. She's in great hands, at home with some surviving hens from the Kapparot of the previous year. She's going to be given the best life from now on. She's going be a symbol for the thousands who weren't as fortunate." Contact New York City council members and LA City council members to demand the enforcement of animal cruelty laws and the rescue of animals tortured and killed during the inhumane ritual of Kapparot by municipal animal services.